One of the benefits of growing up in Worcester, Massachusetts was daily exposure to food from all over the world. My Dad and I would often be tasked with running to the various ethnic markets in the neighborhood to pick up their specialties for us at home. There was (still is) a Lebanese bakery across the street from my grade school that pumped out Middle Eastern delicacies all day and half the night. The smell of lamb and cinnamon would permeate the classrooms and more often than not I would end up standing at their counter on my tip toes looking for a bite to spend my pocket change on. 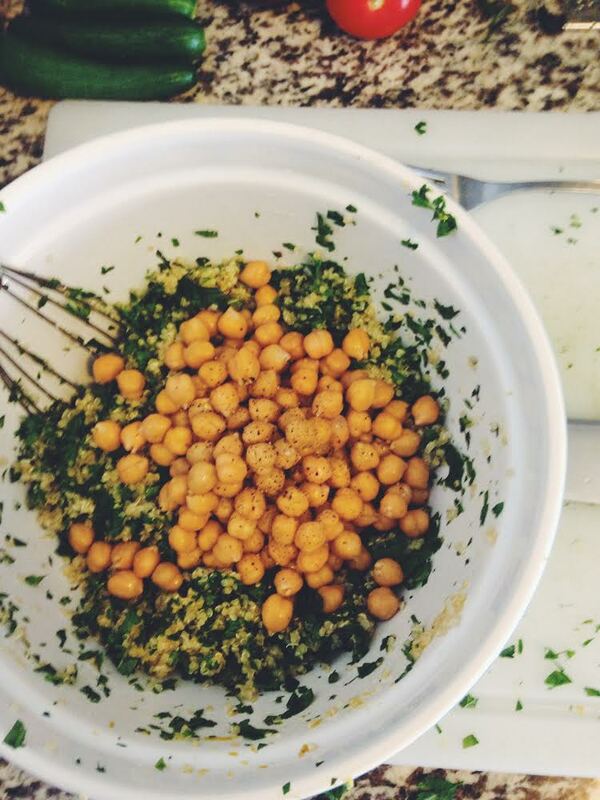 Tabbouleh has stayed with me from those days. It’s often served as a side dish or salad. These days, with a beautiful and vegetarian wife at home my quest for delicious and well rounded meatless entrees has led me to a more robust version of the classic. 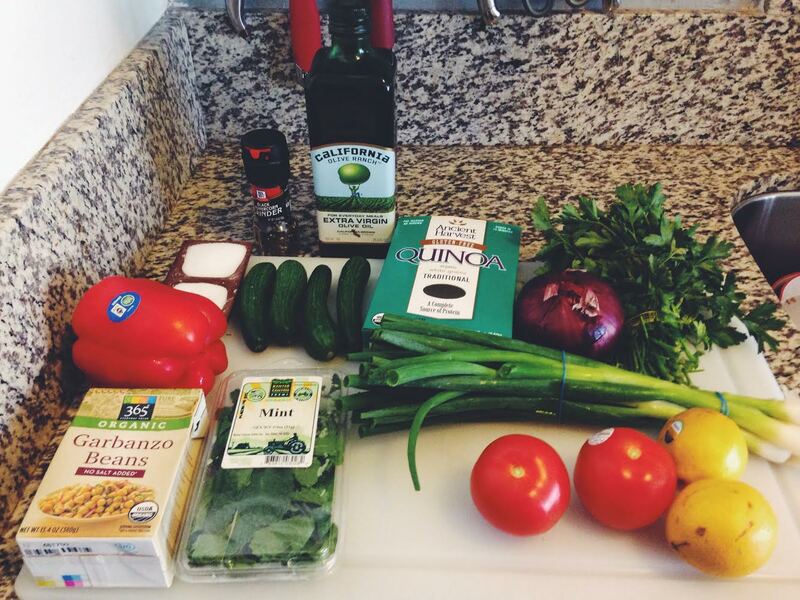 This is everything you need to make my entree ready version of tabbouleh. Start the quinoa on the stove. One cup grain, two cups liquid. Class it up with chicken or vegetable stock or just put in a pat of butter and a big pinch of salt. Turn it up high until it’s boiling, then simmer on low with the cover on until the liquid absorbs in and the grain is starting to separate a little. Meanwhile at the cutting board, break down the parsley and mint. I rip the leaves off of the stems by hand, tossing the stems in a waste bowl and the leaves in a large mixing bowl. If you have a choice use a non metallic bowl because of all the lemon juice going in later. Chop those herbs up nice and fine. There are a lot of ways to do this efficiently, I like to roll it all up tight and start there. After the initial chop it gets a little less structured. Have fun with it and keep your finger tips out of the way. Add a pinch of salt and pepper and a swirl of olive oil and mix it up. Use a grater to zest one of the lemons into the herbs. A cheese grater works fine, just use the smaller holes. Rub down until the outer yellow is peeled and rub the excess off of the grater and into the bowl. I like to juice the lemons into a separate dish so I can scoop out the seeds easier. Squeeze out both the lemons and mix it all in with the herbs. Rinse the beans and toss them in. Mix the rinsed beans in with the lemon, parsley and mint. Break down the rest of the veggies, chopped to your preference. Scoop the seeds and pulp out of the tomatoes to keep the amount of extra liquid down. Rinse the diced onion in a colander under cold water or soak it in a bowl of water. It will take some of the edge off of the raw onion. Toss a pinch of salt and pepper on each ingredient as you go. You want to layer the flavors and treat each ingredient like and individual component. Rinse the beans well. You don’t want any of the liquid from the can in your dish. It’s starchy and smooth and tastes like metal. Add the beans (salt and pepper) and the quinoa to the mixture and mix well. You can eat this for lunch or dinner, as a side or as a main. I don’t worry too much about the quinoa going into the mix warm, it adds a nice dimension to the first meals. You’ll get 6-8 portions out of this recipe. Yum! 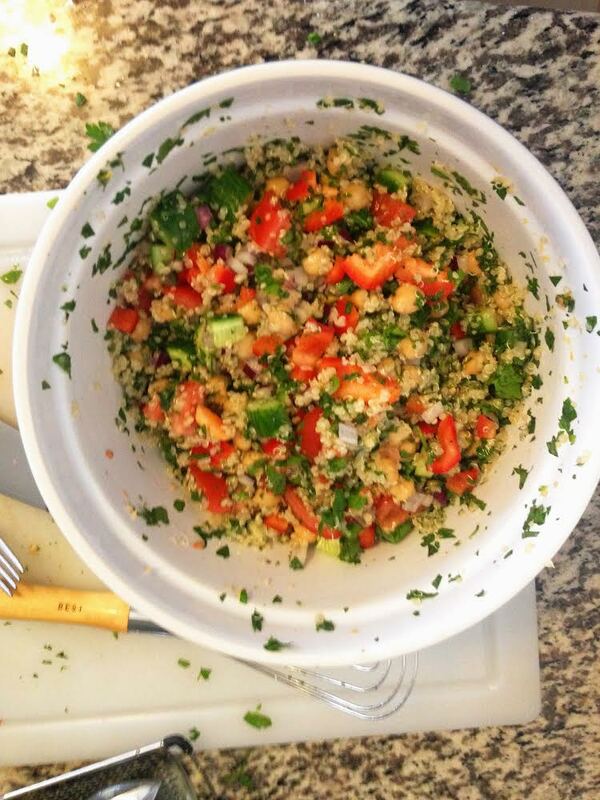 Good for a meal or just a side, this tabbouleh will keep for a week in the fridge.